Steele: Why will Obama talk to Ahmadinejad, not Hayward? Steele is taking aim at Obama for not speaking with Tony Hayward. (CNN) – Republicans are continuing to put pressure on President Barack Obama for not speaking directly with BP CEO Tony Hayward during the ongoing oil crisis in the Gulf Coast. 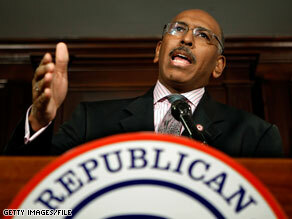 Speaking on Fox News, Republican National Committee Chairman Michael Steele said Wednesday that he doesn't understand why the president is apparently willing to talk face-to-face with Iranian President Mahmoud Ahmadinejad, but not Hayward. In a 2007 presidential debate sponsored by CNN, Obama suggested he would be open to meeting with Ahmadinejad, a comment that drew heavy criticism from his Democratic and Republican opponents. Obama later said that he is willing to meet with Iranian leaders, and that such a meeting "could include" Ahmadinejad. "I don't get it - you tell the American people that you want to sit down and talk face-to-face with Ahmadinejad, but you don't want to talk face-to-face with the guy that has a hand in creating the mess in the Gulf right now, and to try to figure out from him what needs to get done," said Steele. The comments come a day after Obama told NBC he has not spoken with Hayward because "when you talk to a guy like a BP CEO, he's gonna say all the right things to me – I'm not interested in words, I'm interested in actions." Former Republican vice presidential nominee Sarah Palin took a swipe Tuesday night at Obama for his remarks about Hayward, writing on her Facebook page that he should take a more active role in consulting experts who lived during the 1989 Exxon Valdez spill – including her. Palin was 25 years-old at the time of that spill and writes in her book that "most everyone we knew was directly affected, knew someone affected, or went to help clean up the spill." Dear Republicans, are you that dumb that you do not realize the legal implications of one talking to another, that he has either ordered to be investigated or his administration initiating the investigation.? If you looking for something to complain about why don't you question the widely known involvement of Harliburton in this mighty spill. Steele, you're a tool. Go do something constructive for a change. Hey Michael- Put a cork in it. It's obvious that from their valuable input into this complicated & serious problem, that these Republicans really love their country & put "Country First". Actually, what Palin suggested was that Obama contact...." Alaska’s Department of Natural Resources, led by Commissioner Tom Irwin. Having worked with Tom and his DNR and AGIA team led by Marty Rutherford I can vouch for their integrity and expertise in dealing with Big Oil and overseeing its developments. We’ve all lived and worked through the Exxon-Valdez spill. They can help you...."
Too bad CNN wanted to be catty and snarky about Palin's advice; too bad we cannot put politics aside long enough to work together to find solutions. The question is not why the President won't speak to Mr. Hayward. The real question is why are Mr. Steele and the Republicans against removing the $75MM dollar liability cap the oil companies like BP are hiding behind. Oh, I get it...they are big contributors to Mr. Steele's lavish lifestyle, as well as to the Alaskan US Senator–can't pronounce her name. Politicians...are like ants...they serve a purpose but not in my yard. Hayward needs Obama to tell him what he should be doing??? I thought the Republicans felt that Corporate CEOs could solve Americas problems better than an "overloaded Government." I guess they've changed their minds....again. Dude shut up and resign! should be handeling the most horrific oil spill in history. Everyone I know is concerned , that Obama is not talking to the CEO of BP.